We recently took an in-depth look at some of the most costly pool care mistakes you can make, and, as promised, we return with the conclusion of our two-part series. It can seem overwhelming with all of the tasks to complete and information to remember, but owning a pool is something we think is pretty fun. Do you need pool service in Goodyear? What about getting your pool cleaned? Well, look no further than your pool gurus at Universal Pool Services. Give us a call today to schedule your appointment. 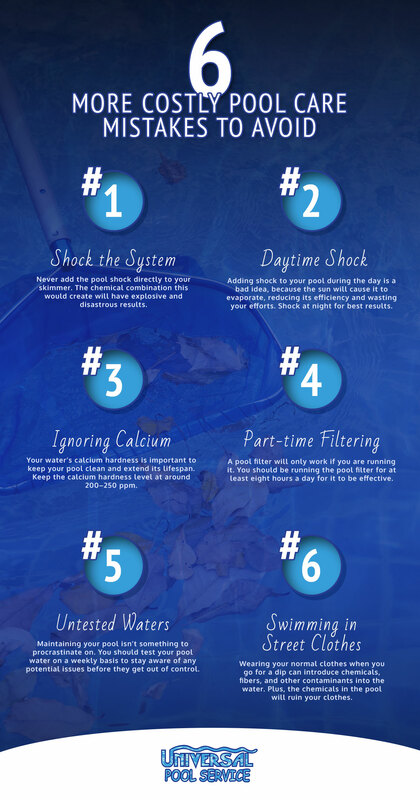 As we touched upon in our last blog, pool shock is a vital piece of pool maintenance that should be handled with care. While some of the mistakes we’ve discussed thus far are pretty minor, this one has the potential to be deadly. You should never add the pool shock through your skimmer. Why? When you combine calcium hypochlorite or dichlor pool shock with chlorine, it creates a deadly gas. If this combination occurs in the small space within the skimmer, that gas will expand and explode. Avoid this by keeping your pool shock separate from your skimmer. When adding shock, always follow the manufacturer’s instructions and wear safety gear. While the last point covered the potentially deadly effects of pool shock, this entry is focused on efficiency and cost. If you add pool shock to the water during the day, you’re wasting time and money. This is because the sun will burn off one ppm of the shock every hour. Not only does this reduce how efficiently the shock is at balancing your pool’s chlorine levels while removing chloramines, but it also means you’ll have to spend more on shock to get the job done. It’s recommended you shock your pool at night once a week. This will ensure it has enough time to do its job while working as effectively as possible. The ratio should be one pound of shock for every 10,000 gallons of water in your pool, with the goal being a chlorine level of 13 parts per million (ppm). Just like the pH level of your water, you need to balance the calcium hardness to keep your pool clear, clean, and safe. With that said, you don’t want that level to go too high, because that will make the water cloudy. Calcium hardness can actually protect vinyl liners, concrete, plaster, filters, and fiberglass, which makes them last longer. The recommended level for calcium hardness is 200–250 ppm, which you can use calcium hardness increaser to reach. It’s important to check this regularly because evaporation and splashing can reduce the level. You can even save some time and money by using calcium hypochlorite shock to shock the pool while adding calcium to the water. Your pool filter will only work if you run it. While that might seem obvious, you’d be surprised how many pool owners think they can get by with rarely running their filters. The fact is, when the filter isn’t running, it isn’t catching those contaminants that can make your pool a bad place to be. Sure, this is a pretty minor mistake to make, but it’s just not worth it. Make sure you’re running the pool filter at least eight hours a day, every day. This should provide enough time for all of the water in your pool to pass through the filter, resulting in clearer, healthier water. With how complex the chemical composition of your pool can be, it’s not something you can just eyeball and guess at. This makes testing the pool water on a weekly basis a vital part of your pool care procedure. Not only will this help you keep your pool looking clean, but it will also help you catch potential problems before they’re exacerbated. With either test strips or a liquid test kit, test your pool water for pH and alkalinity levels, calcium hardness, cyanuric acid, salt, and total dissolved solids (TDS) levels, and copper and iron. While you don’t need to hit all of these steps every single week, it’s important to at least check alkalinity, pH, and free chlorine levels each time. For a more thorough analysis, take a sample of your pool water to a pool supply store once a month. You’ve likely seen it in a classic high school movie, where during a particularly wild party, everyone jumps into the pool while wearing their normal clothes. Sure, it might have looked fun, but your street clothes belong just there — in the street. When you wear street clothes in the pool, you add chemicals, fibers, and other contaminants into the water. Not only does this make your normal pool care more difficult, but the chemicals in the pool water will also end up ruining your clothes. If you’re looking for a tie-dyed look, there are better ways to do it. Stick to swimsuits when you want to go for a dip. 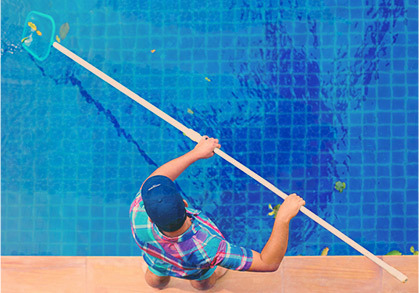 There’s a lot to remember in order to keep your pool in good shape, but we hope these tips help you steer clear of mistakes others have made over the years. Keep them in mind so you can enjoy your pool for years to come. Are you looking for quality pool service in Goodyear? 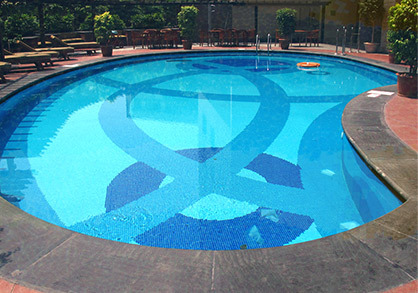 Do you want to prepare your pool for the upcoming winter? Call Universal Pool Service today to schedule your appointment. 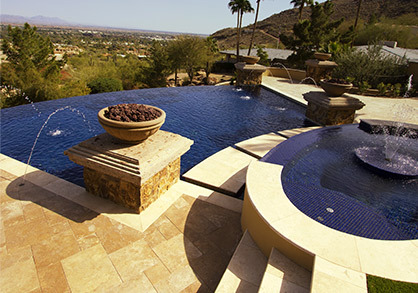 We are also proud to service pools in Surprise, Litchfield Park, Verrado, and Avondale. We hope to hear from you soon!